The decision to bar him from teaching was taken after a meeting of teachers and students from the department. Kanak Sarkar divested of his duties. 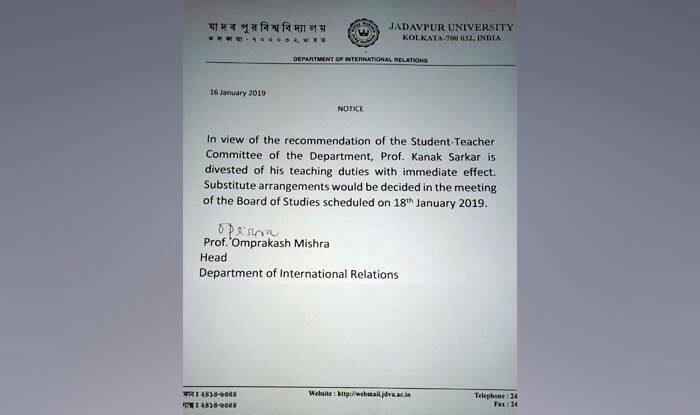 Jadavpur: Jadavpur University professor Kanak Sarkar, who made controversial remarks in a Facebook post and likened a virgin girl to a sealed bottle –has been divested of his duties with immediate effect. Sarkar, who works in the varsity’s International Relations department has now been barred from taking classes or even entering the campus. The decision to bar him from teaching was taken after a meeting of teachers and students from the department. Omprakash Mishra, the head of the international relations department, asked the vice-chancellor to expel Kanak Sarkar. Mishra also announced — after meeting the VC — that Kanak Sarkar had been barred from entering the campus pending an inquiry. National Commission for Women (NCW) chairperson Rekha Sharma is scheduled to meet Jadavpur University’s vice chancellor on Friday to discuss the matter involving a professor who allegedly wrote a “misogynistic” social media post. Strongly objecting Sarkar’s comments, Sharma wrote to Jadavpur University VC Suranjan Das and said the NCW is seriously concerned over the matter. She said that she will meet Das during her upcoming visit to Kolkata on Friday. The NCW also took suo motu cognisance of the professor’s “shocking, misogynistic” lessons. It asked the West Bengal DGP to probe the matter and take appropriate action in the case and apprise the commission of it. A few days Kanak Sarkar’s took to Facebook and wrote a post in which he likened a “virgin girl” to a “sealed bottle” had created outrage. “Are you willing to buy a broken seal while purchasing a bottle of cold drink or a packet of biscuits?” Sarkar, who teaches Political Science at Jadavpur University, wrote.